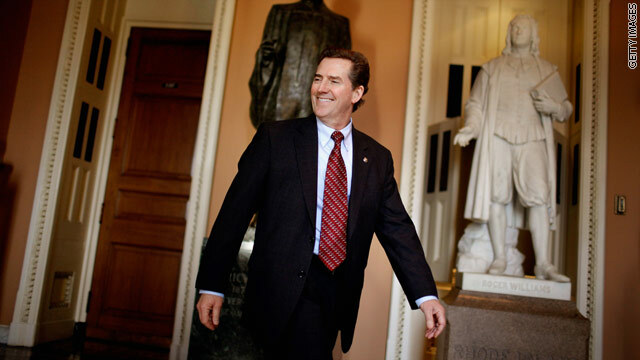 (CNN) - Republican South Carolina Sen. Jim DeMint, a leading force in the Tea Party movement, said Wednesday on CNN's "The Situation Room" that he's not running for president. CNN Anchor Wolf Blitzer asked DeMint, "Are you going to run for the Republican presidential nomination?" DeMint responded, "No, no I'm not." His comment comes on the same day that he introduced a bill to repeal the health care law signed by President Obama and one day before the inaugural meeting of the Senate Tea Party Caucus, for which he is a founding member. There is a God in heaven and he really does protect us from evil. Thank you!!! No, DeMint doesn't want to run for president, he and his tea baggers don't want less government, they want to overthrow the government, it's called sedition. Demint own rigid ideology will prevent him from being an affective president because he can't use common sense to remedy problems because he demonize those remedies for the past 2 years. He thinks government don't have a role in our economy. Even though he criticize every job lost in the economy, and blame the government. He still want to get rid of every social program. He is not a people president. Why would he run for president if he get paid to do absolutely nothing as a senator? Smart guy, why would you run when you know it's a sure bet that you will lose. This is a GOOD ANSWER!! This is the first time I will agree with a RepubliCAN'T's answer of NO! !